As we jump into 2012, your toddler will be learning that God wants me to share! during the month of January. Each weekend, your child will hear the story of Jesus feeding the 5,000 found in John 6:1-14. 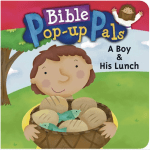 We’ll be reading a fun Bible pop-up book called A Boy & His Lunch. 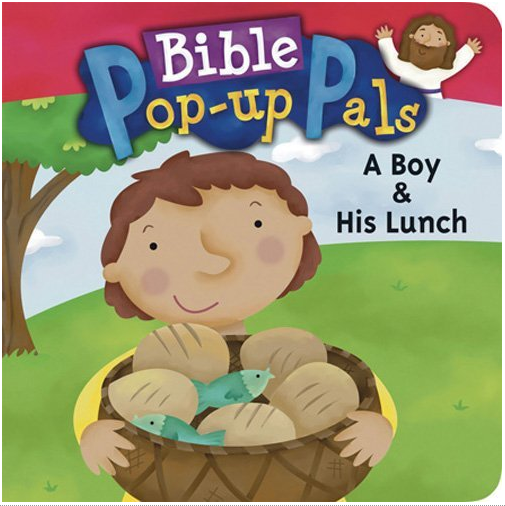 This interactive book tells the story of the boy who shared his lunch with Jesus and how Jesus fed 5,000 people with the boy’s lunch! Join with us in reading this book to your child – you can purchase the book online HERE or HERE. Next weekend we begin a brand new 8 week series in Quest called Spy Chase. We’ll learn about 8 different people in the Bible who modeled what a great friendship looks like according to God’s word. And we get to help Agent O and his spy team teach the people of Spy City how to be friends! Don’t miss this weekend as kids receive their very own spy folder and look to collect evidence for their folder each week of the series. In Motion we are going ORANGE to start 2012! In anticipation of Code Orange Revival, we will be meeting members of The Code Orange Club. Jake, the newest member of the club, is also new in town and will learn about obedience. He will see that obedience is choosing to do what’s asked of you and will see how obedience can lead to unity among Jesus’ followers. 1 Corinthians 11:1 says, “Follow my example as I follow the example of Christ.” It’s our memory verse for January – it’s a simple yet concise way to teach kids that by choosing to obey their parents or authority figures, they are choosing to follow in the example set by Jesus. It’s going to be an exciting month! All we can say about this weekend is it will involve oranges and stinky feet . . . can’t figure out what they have in common? Make sure you get your child to Motion this weekend to find out!